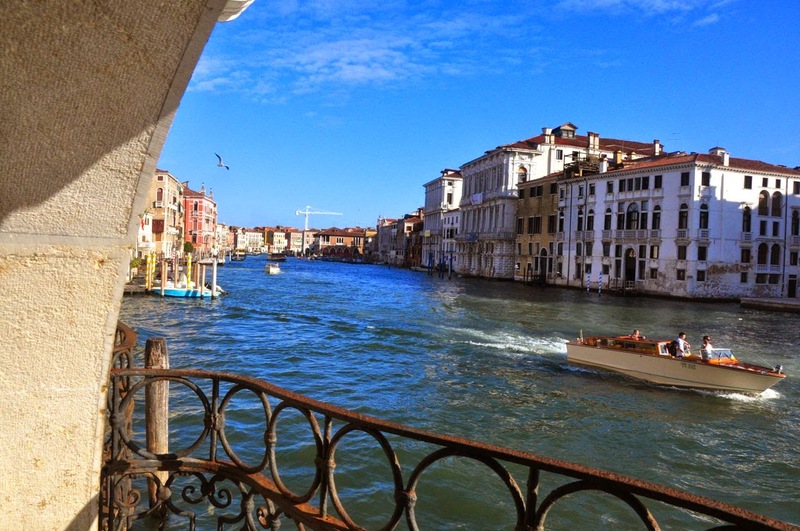 Venice is a great city just to meander and wander around. No cars, traffic lights, horns honking - well a few boats do have horns and of course there were the 2 boat drivers having a bit of 'water rage' when we first left the train station - yelling at each other for about 5 minutes while we decided NOT to take the water taxi (€80!) and walk the 20 mins to our apartment. 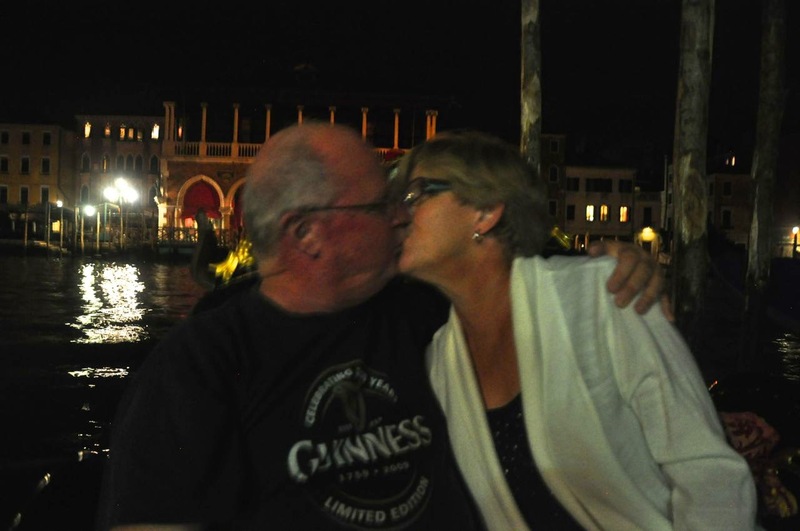 Speaking of our apartment, it was right on the grand canal a bit north of the Rialto bridge. And I mean right on the canal - we could almost reach out and touch the water. It was quite amazing to see the amount of traffic going by here all day - the vaporetto (water buses), ambulances, boats delivering produce to the stores, garbage 'trucks', police, EVERYTHING in the city is done by boat. 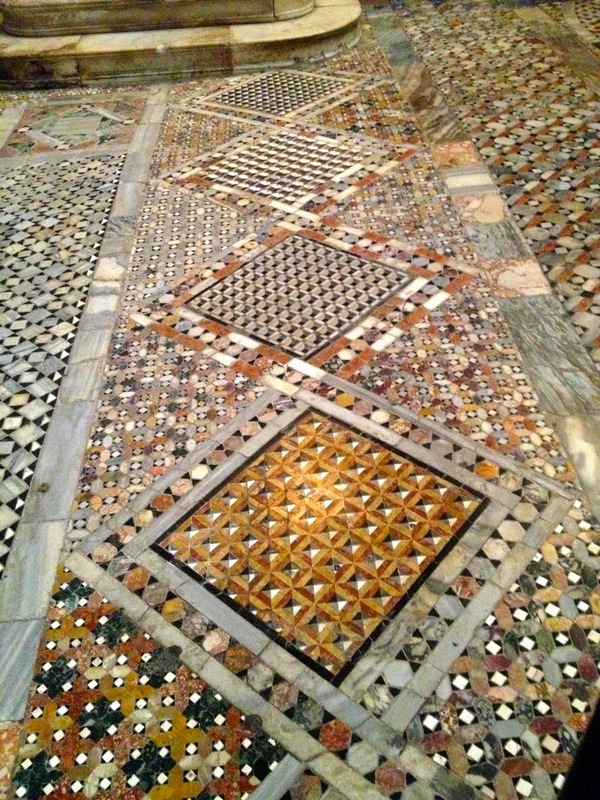 We hit the main tourist sites - including St. Marks Basilica - again an amazing church lined with gold mosaic tiles for which no picture can do it justice. 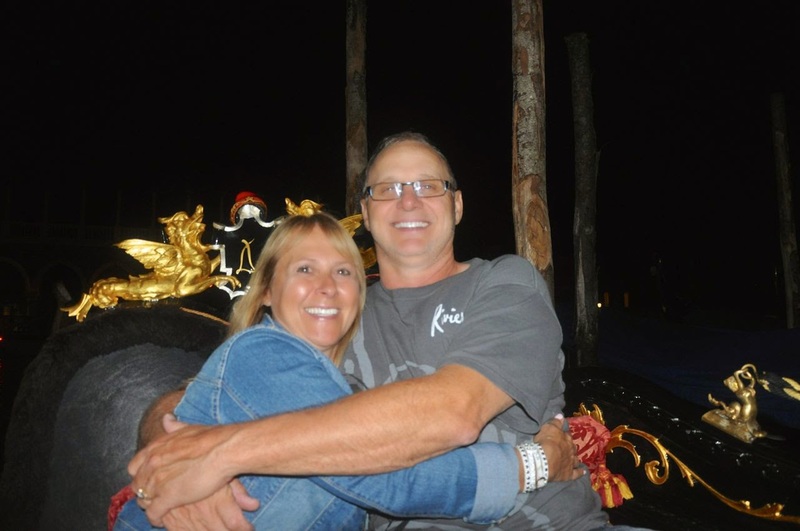 Even convinced Garry to take the 'cheesy' gondola ride - at night when the canals were peaceful and calm and ultra-romantic (hah!). Most complaints about Venice are about the overload of tourists which is likely helping to cause the island to sink lower into the sea! However, without tourists I'm not sure there would be a Venice. Almost all our accommodation for this trip was booked through Airbnb and if you haven't used it before I'd recommend it. Most of them were apartments with kitchens and living rooms; quite a range of quality but the range went from very good to excellent. You also need to check the details carefully including bed arrangement - lots will claim that the couch is a bed. All in all Italy is like one great big museum/art gallery/history lesson and even though we missed lots it was wonderful to see some of the major works (Sistine chapel/David). The food has less variety and less spice than you would generally associate with Italian food - I guess what we eat are all 'americanized' versions. We were pretty done with pasta and pizza by the end of our trip. Under the Tuscan . . .
. . . rain. On our last morning in Florence we were awakened by a very loud thunder and rain storm. 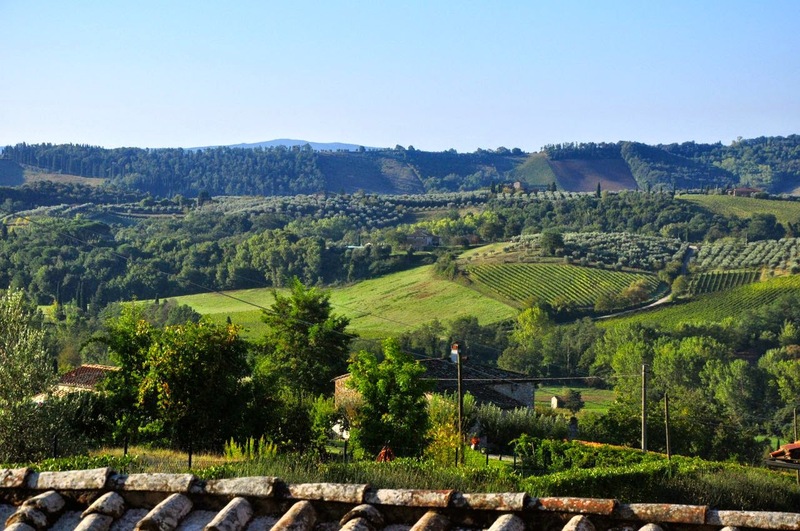 That was the morning we took the train to Siena, rented a car and stayed one night at Montepulciano. The walled village is a series of relatively steep hills and the rain stopped just long enough for us to walk up and down a few. 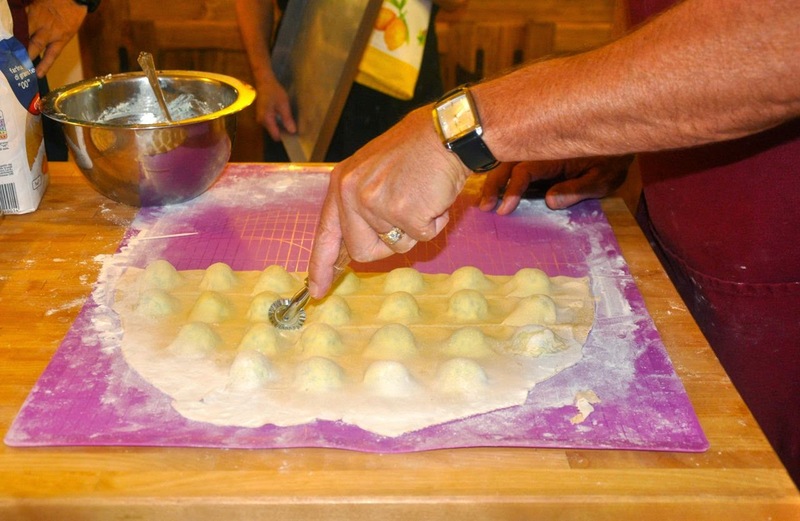 The next day, near Cortona, was our scheduled cooking class. We met our teacher Rita in town for coffee and pastries, during a downpour, and decided on a menu for the day. Then we went to the little village shops to get our vegetables, bread, chicken, etc. The only complaint about the cooking class was the over abundance of food - we had enough leftovers for several days but unfortunately no way to keep them (except for Alanna's biscotti of course). First we prepared several dishes for lunch - rice stuffed tomatoes, eggplant topped with pesto, tomato and cheese, zucchini blossoms stuffed 3 different ways, bruschetta topped with either chicken livers (negative reviews on that one) or eggplant/onion/garlic, large variety of meats and the local sheep cheese (peccarino). And everything either fried in, brushed with or topped with copious quantities of olive oil, some of produced on the farm of the teacher. We barely finished eating lunch when we began making 2 types of pasta - the local specialty - pici (pr. peechee) - which is hand rolled, and chard/ricotta filled ravioli. The pici was topped with a zucchini carbonara and the ravioli with a puréed tomato sauce that we had made first thing and had simmered all day (hint: never boil it). The third course was chicken scaloppine with lemon sauce and we finished with a lovely tiramisu that had also been chilling since morning (and the biscotti). There were only the 4 of us so you can imagine why there was so much leftover. It was a long, but satisfying day - we all learned lots. The next day poured as we drove through what we could only imagine was the scenic Tuscan countryside. We found one of the famous thermal hot springs (Rapolano) and spent a few hours soaking in the sulphur pools before we ended up in our destination of San Gimignano - (another) beautiful medieval village - just as the sun finally came through. 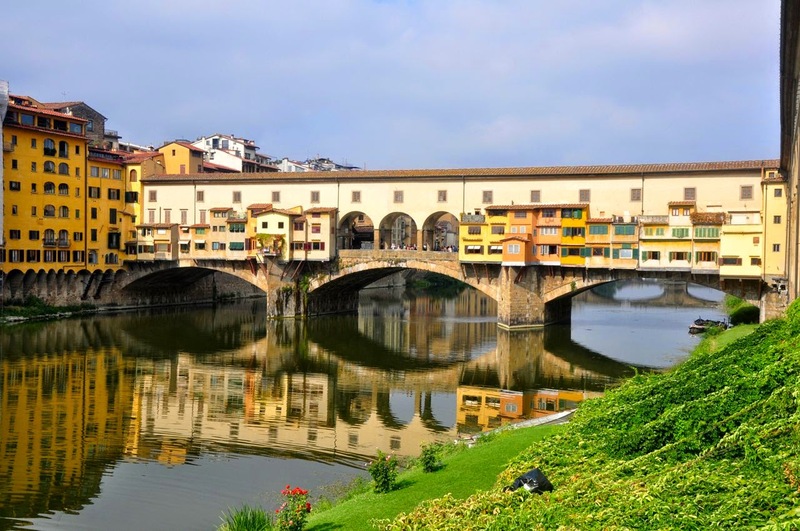 Ponte Vecchio in Florence - the only bridge Hitler didn't bomb in WW2 - presumably because of his appreciation for the art work housed on the top. I'd have to say that of all the big cities Florence has been my favourite - the beautiful renaissance architecture, Michelangelo's David and the huge Boboli gardens all contribute to its beauty. Everywhere we've gone we've remarked that it would be nice to stay there longer, although I think the 4 of us agree that Tuscany tops the list. The view from our apartment in San Gimignano - the hills are beautifully manicured. If you like stairs . . . 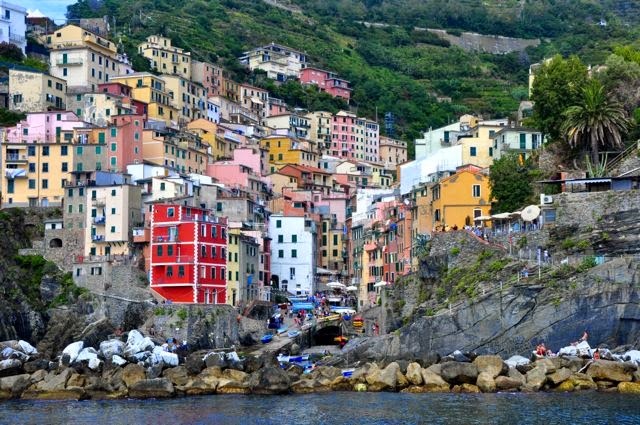 If you like stairs Cinque Terre is the place to be. I can't even begin to think how many stairs I've climbed in the past 2 days since we got here. However, the natural beauty of the place is almost enough to make you forget about all the hills. I can certainly see why it's become a favourite tourist destination. We're staying at Monterosso, the most northerly of the 5 small villages on the hills above the Ligurian Sea. The thing to do here is hike the trails from one village to the next so of course that's what we did yesterday. Well at least we hiked from one to the next which took about 2 hours, mostly uphill (or so it seemed). My calves are saying things to me today that I don't want to hear. 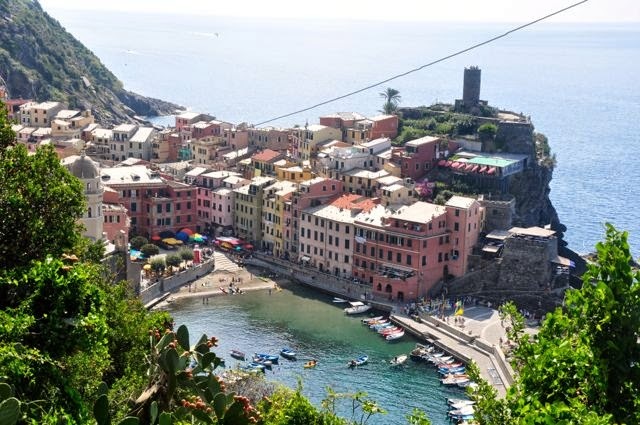 This is at the end of the hiking trail coming down into Vernazza. This morning (Saturday) we took the boat to Portovenerre, a larger village about 1.5 hours away, with stops at the other villages along the way. 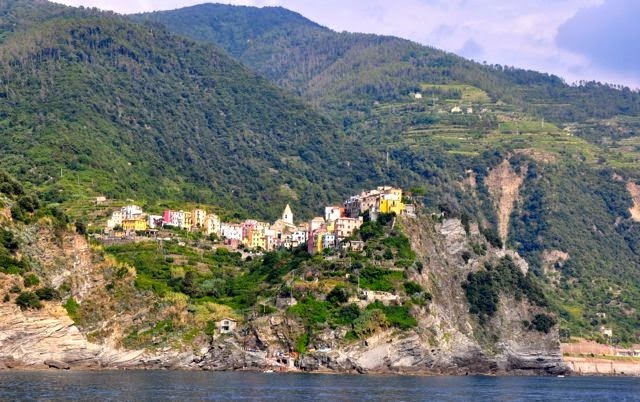 Then back to Manarola and Corniglia - where you have 383 stairs up to the village from the train station (thankfully we took the bus up, stairs down). Each of the villages have narrow, winding roads with very few vehicles. They were originally fishing villages, obviously still lots of fishing from the offerings in the restaurants. The floods in 2011 in this area were quite devastating and some of the lower (and easier) trails are still being restored. The cliffs rising from the sea are steep and rocky and it's very odd to see houses, vineyards, churches, etc. built high on the edge with no visible way to get there (except stairs of course). Apparently there is one residence that requires 1000 stairs to get there. The hills are terraced with vineyards and lemon groves. Monterosso appears to be a real happening little place. On Thursday night we happened into the annual Walnut competition - kind of like bowling only with walnuts. Then last night there was a wine festival so we bought tickets and had samplings of several types of wine. Today was a band festival - several different military type bands playing in the town square, complete with majorettes. Both Ross and I are hoping that tomorrow (Sunday) will bring a bit of peace - I think we're both exhausted from holidaying! 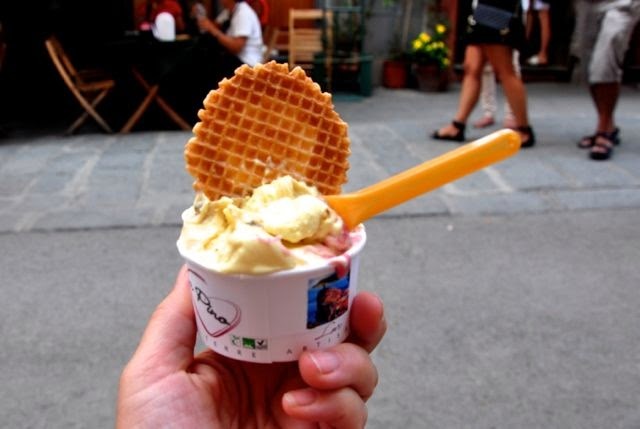 My daily dose of gelato. I wouldn't say that the Sistine Chapel was the only reason I came to Italy but it was certainly up there on my list. Our tour started at 7:30 am and we entered the Vatican about 8:00 'before the public'. By the time we made our way through to the Chapel there were actually quite a few people there - but not as crowded as it would get later. According to our guide, to see everything in the Vatican Museum would take 7 days at 7 hours per day and our guide did her best to show us as much as possible in the 3 hours we were there. Much of the time we just got a quick glimpse of the tapestries, sculptures, relics, paintings as we moved to another section of the museum. 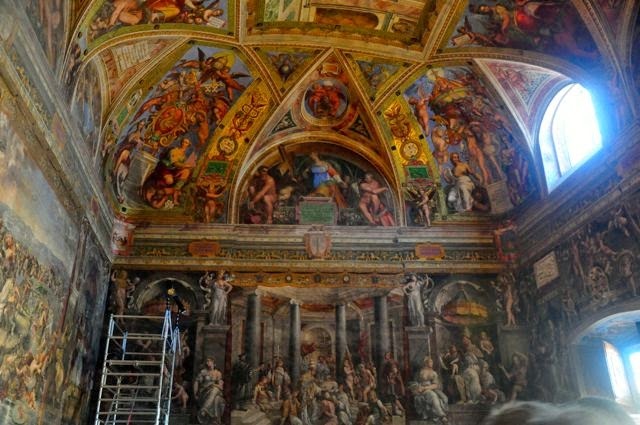 In the 1980s the ceiling of the Sistine Chapel was restored but since the Vatican didn't have enough money for the restoration (?) the Japanese came up with the 4 million euro necessary. 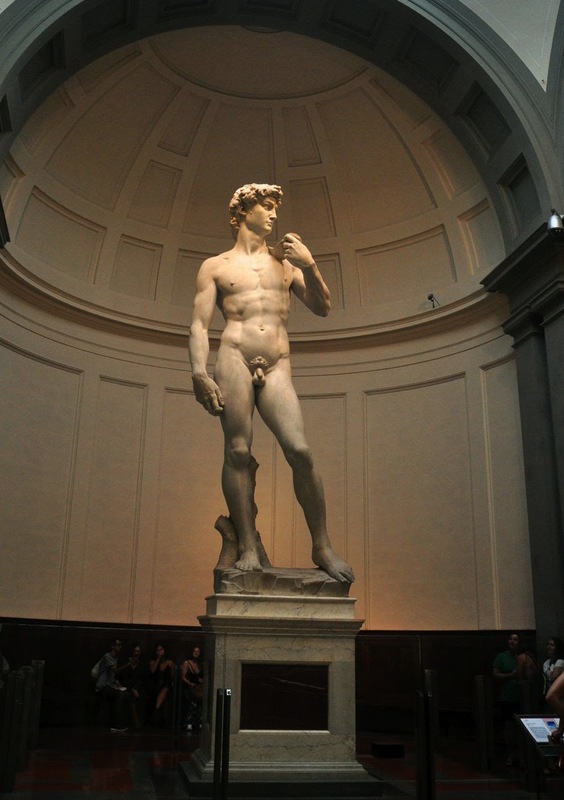 As part of the deal the copyright for Michelangelo's masterpiece was retained by Japanese TV and no photos are allowed. Of course we had originally thought it might have to do with preserving the artwork! 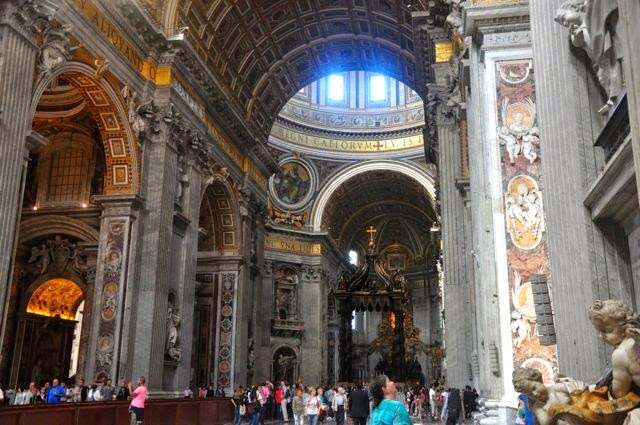 St. Peter's Basilica is (perhaps) the largest in the world and holds up to 50,000+ people. It covers over 5 acres. The top of the dome, designed by Michelangelo, is over 400 ft from the floor. A lot of the columns and artwork found here were actually taken from other sites and "repurposed" here. I found it amazing, not so much for it's religious significance, but more for the intricate tile floors, mosaic artwork, Michelangelo's sculptures, etc. A magnificent place! 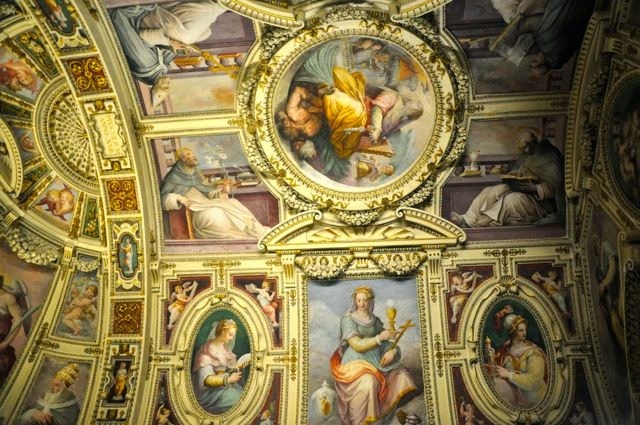 The whole Vatican museum is more like an art gallery than a church. We arrived to a very hot and sweltering Rome on Saturday. The 2 bdrm apartment we rented on airbnb is quite roomy - huge bedrooms, 2 bathrooms, big living area and kitchen with everything except a toaster and air conditioning. We're about 10 mins from the Vatican so on our way to find the hop on hop off bus on Sunday we noticed a large crowd starting to gather by St. Peter's square. Alanna approached one of the security guys who mentioned that the crowd was here to hear the pope speak at noon. 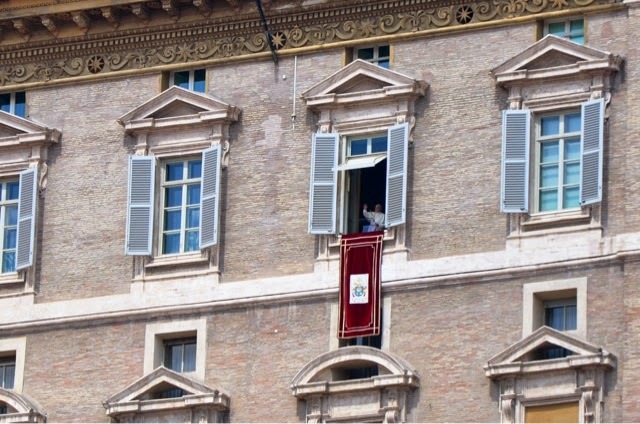 So we decided to come back after the tour and joined a few thousand others as the pope gave his sermon in Latin then Italian. 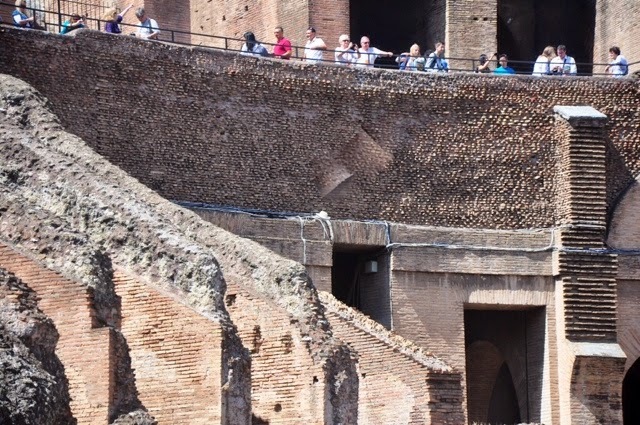 When the Romans built the colosseum 2000 years ago I can't imagine they thought it would last this long. Only an earthquake in 1349 managed to down part of it. The first few hundred years after it was built saw lots of death and violence - animals, gladiators, Christians. We joined a tour but it was really a waste of time as the guy just droned on for about 30 minutes then we wandered by ourselves. Most of you would recognize Ross and his Tilley hat - he's quite attached to it and they are inseparable in sunny situations. Well today we ended up in a slightly different situation. 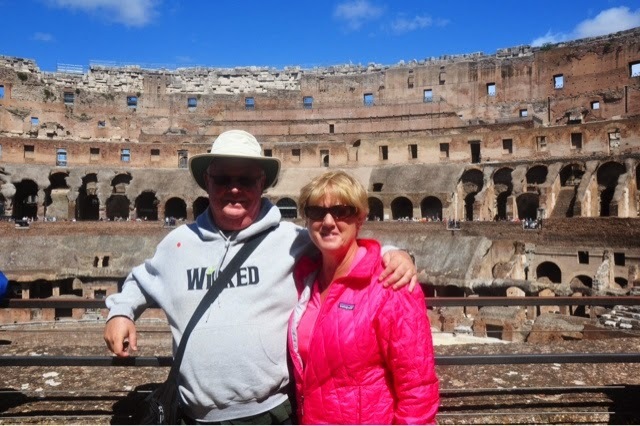 We had just ended the 'tour' on the 2nd level of the colosseum when a rogue gust of wind blew it down over the edge into the middle of the ruins. He raced down the nearest flight of stairs and proceeded to search high and low for his hat. Well he didn't look quite high enough as it had come to rest on a small ledge half way to the ground. And there was no possible way to retrieve it! Meanwhile Alanna, Garry and I couldn't stop laughing although Ross was still in shock. He stood there looking, almost pleading - all of a sudden it broke loose and wafted gently down in front of us. One more Tilley (and Ross's scalp) saved!!! You can see it up about 20 ft on this ledge.